This exciting tour was suggested and planned by casework committee member and structural engineer, Stuart Tappin, who has worked extensively in India. It will be led by Catherine Croft, C20 Director, and Jon Wright, former casework officer and now heritage adviser at Purcell UK. There will be architectural expert guides (see below) and the logistical expertise of a local Cox & Kings representative. The tour will commence on Saturday 9th November 2019 with an overnight flight to Dehli. There will be four nights in Delhi and the days will be spent exploring Mughal architecture, Lutyens’ New Delhi and post-independence Delhi. On Thursday 14th November the group will travel by train to Chandigarh for three nights. Tour highlights will include Le Corbusier’s Capitol Complex and Nek Chand’s Rock Garden. On Sunday 17th November the group will fly to Ahmedabad and Monday and Tuesday will be spent exploring the important C20 architecture of the city – see article in Autumn 2018 C20 magazine. On Wednesday 20th November there is a choice of flying back to the UK or continuing by train to Mumbai for a two night visit, returning to the UK on Friday 22nd November. The detailed itinerary, including hotels and meals included can be viewed here. All bookings and enquiries should be made through Jayant Naniwadekar at Cox & Kings who will be the sole point of contact for making reservations. The contact details are 020 3930 5073 ext 299 and his working hours are Monday – Friday 09.00-05.30. His email address is Jayant.Naniwadekar@coxandkings.co.uk Cox & Kings are also able to advise on individual tailor-made extensions to the tour. When calling or emailing Cox & Kings please quote tour code XTW. For anyone choosing the Mumbai extension, the relevant tour code is XTWBOM. Places are limited so please book early. Members’ price: £3,045 sharing, £625 single supplement. Mumbai extension: £595 sharing, £255 single supplement. Chandigarh guides: Professor Sangeeta Mehta: Principle of Chandigarh College of Architecture (CCA). Seema Gera: Deputy Curator Government Museum and Art Gallery Chandigarh. Both currently working on a Getty Foundation “Keeping it Modern” funded Conservation Management Plan for Le Corbusier’s Government Museum and Art Gallery in Chandigarh, India. 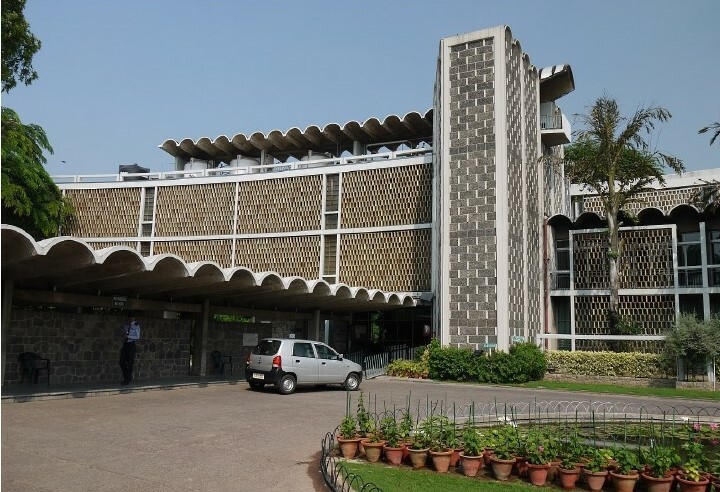 Ahmedabad guide: Rabindra Vasavadra Head, Masters Programme in Conservation Studies, Faculty of Architecture, Graduate School, CEPT University, Ahmedabad, India. Mumbai guide: Vikas Dilawari: Conservation architect with more than two and half decades of experience. Double Masters in Conservation from School of Planning and Architecture (New Delhi) and from the University of York. He was the Head of Department of Conservation Department at Kamla Raheja Vidyanidhi Institute of Architecture (KRVIA) Mumbai from 2007 to Aug 2014. His practice has successfully executed several conservation projects ranging from prime landmarks to unloved buildings of Mumbai. Twelve of his projects have won the UNESCO ASIA PACIFIC Awards for Cultural Preservation in SE Asia. He has lectured and written extensively on the subject of conservation nationally and internationally. This event is not available to book online here (please see event description for more details). The Twentieth Century Society cannot accept your order until you have paid for it in full. You may pay by MasterCard, VisaCard, Visa Debit, Visa Electron, Visa Connect, Solo. Upon payment, the Twentieth Century Society will confirm receipt of your order by an acknowledgement displayed onscreen once your payment details have been accepted, followed by an e-mail which will be sent to the e-mail address you provide on your order details. You will have an opportunity to check and correct any input errors in your order up until the point at which you submit your order by clicking the "next" button on the checkout page. Your order represents an offer to us to purchase the goods which is accepted by us when we send you an e-mail confirming acceptance of your order. A legally binding contract between us is created at the point of our acceptance of your order. The Twentieth Century Society reserves the right to choose not to accept your order for any reason, at its discretion, and will not be liable to you or anyone else in those circumstances. The supply of products is subject to availability. The prices for goods and services displayed for sale on this website are as set out on the website. All prices are in pounds (£) sterling, inclusive of VAT. Delivery may be charged in addition, and any such additional charges are clearly displayed under "Shipping Charges", where they apply. Prices may change at any time prior to (but not after) acceptance of your order. In the unlikely event that the price of an item has been incorrectly advertised on this website, we will contact you by e-mail (at the address provided with your order details) or telephone you, to ask whether you wish to proceed with the order at the correct price. If you are not happy to proceed, or we are unable to obtain your instructions, we will cancel the order and provide you with a full refund of any monies debited. By using a credit/debit card to pay for your order, you confirm that the card being used is yours. All credit/debit card holders are subject to validation checks and authorisation by the card issuer. If the issuer of your card refuses to authorise payment we will not accept your order and we will not be liable for any delay or non-delivery and we are not obliged to inform you of the reason for the refusal. We are not responsible for your card issuer or bank charging you as a result of our processing of your credit/debit card payment in accordance with your order. Subject to availability, the Twentieth Century Society will use its reasonable endeavours to deliver the goods you have ordered, within 7-14 days of you placing the order, but we cannot accept any liability for late deliveries which are due to circumstances outside of our reasonable control. We will deliver the goods direct to the address you specify when you submit your order. Deliveries are made Monday to Friday (excluding bank and public holidays), normally between the hours of 8am and 5pm. The precise timing of a delivery cannot be specified. If your order consists of more than one item, those items may be delivered separately, but we cannot deliver items within the same order to multiple addresses. Deliveries will be made to your door. The Twentieth Century Society is not responsible for any additional carrying or positioning of goods. Once delivered, the goods will become your property (provided they have been paid for in full) and your responsibility and the Twentieth Century Society will not accept any liability for their loss, damage or destruction after they have been delivered. Certain deliveries must be signed for. If the goods you order are not available, for whatever reason, the Twentieth Century Society will inform you of the position by e-mail (at the address provided with your order details) or telephone. If the goods are temporarily out of stock, we will ask if you wish to wait for the goods to become available. Unless you advise us of your wish to do so, the Twentieth Century Society will refund any money debited from your payment card by re-crediting your account. The refund will be made as soon as possible and in any case within 28 days of notifying you of the non-availability of the goods. You may cancel your membership or order for any products, or order of any services at any stage before the goods are delivered to you, and up to 14 days afterwards (please see cancellation and refund policy 4.1 for membership, 4.2 for refund policy on event bookings and 4.3 for publications and merchandise products), by notifying us in writing. The Twentieth Century Society shall refund your payment card account with any monies debited from it as soon as possible after receiving notice of cancellation from you, and in any case within 30 days of receipt of that notice, subject to your returning the goods as set out below. If you need to cancel your order please read the following relevant sections. If you choose to cancel your membership order, you must return any goods including membership packs received by you to the relevant address (see below) at your own risk and cost, and, unless you are returning faulty or defective goods (see Section 5), in as good condition as when they were delivered to you. No refunds will be given for membership subscriptions after 7 days. Members are reminded that they should have adequate travel insurance. No refunds will be given for any reason for events costing £12 or less. In all other instances, where cancellations are made more than a month before an event, fees will be returned, subject to a deduction of £12 per ticket to cover administrative costs. No refunds will be available for late cancellations within one month of the event. Once confirmed as part of the events programme, these will have the same cancellation policy as UK based overnight trips (Section 4.2.2). We may ask for expressions of interest backed by a small deposit in instances where we need to make an assessment of the amount of interest in a destination. If the foreign trip is cancelled or postponed by us, the deposit will be refunded. The Twentieth Century Society will repair, replace or offer a full refund for faulty or defective goods returned to us for which we are responsible in accordance with your legal rights. In the event that you wish to return goods to us because they are faulty or defective, you should notify us using the details set out in Section 4 and return the goods to the relevant address set out there. If you order products for delivery outside the United Kingdom, they may be subject to import duties and taxes. You will be responsible for these. We have no control over such charges and cannot advise you as to what they may be, although your local customs office may be able to assist. For deliveries outside the United Kingdom, you will be regarded as the importer and it is your responsibility to comply with all laws and regulations of the country in which the products are to be delivered. Cross-border deliveries may be subject to opening and inspection by customs authorities. The Twentieth Century Society will not be liable to you where performance of any of our obligations to you is prevented or restricted by any circumstance or cause beyond our reasonable control. You are responsible for the use you make of the goods. To the extent not prohibited by law, the Twentieth Century Society accepts no liability for any loss which is not reasonably foreseeable or for any business loss (which includes loss of profits, contracts, goodwill, opportunity and other similar losses). The Twentieth Century Society does not limit its liability for death or personal injury caused by our negligence. If any part of these Purchase Terms is found to be unenforceable as a matter of law, all other parts of these Purchase Terms shall be unaffected and shall remain in force. These Purchase Terms and any contract between us shall be governed by and interpreted in accordance with English law and any dispute will be brought before the English Courts, unless you live in another part of the United Kingdom, in which case the applicable law of that part of the United Kingdom will apply and any dispute will be brought before the courts there. We are required by law to inform you that sales can be concluded in English only and that no public filing requirements apply. The Twentieth Century Society may change these Purchase Terms at any time, provided that any such change will not affect any purchases you have made before the change is implemented. The Purchase Terms currently in effect are those published on this website. Neither the Twentieth Century Society nor the Leader or Organiser of any event or walk advertised in the C20 Magazine or any other programme organised by the Society shall be held liable for the death or injury, accident or damage to the person or property (including theft or loss) of any member of the Society or any guest or any person occurring during or arising from participation in any of the events advertised in this Magazine or programme. Members are reminded that they should have adequate personal and travel insurance cover. "Us" means the Twentieth Century Society either alone or together with you, as the context requires; "You" means the person ordering goods subject to these Purchase Terms.